Donald Trump’s frustration over his inability to fulfill his signature 2016 campaign promise to curb illegal immigration led him to oust his second homeland security chief, as the president eyes his re-election prospects next year. Homeland Security Secretary Kirstjen Nielsen resigned at Trump’s request after a meeting with him on Sunday at the White House residence, according to people familiar with the matter. Her departure follows Trump’s decision last month to give a larger say on immigration policy to a hard-line aide, Stephen Miller, who had complained that Nielsen was too weak, some of the people said. Trump has been mulling for at least the last week the appointment of both a replacement for Nielsen and a possible immigration “czar” for his administration, the people said -- an official who the president and his top advisers believe can accelerate his policies, including construction of more border wall. 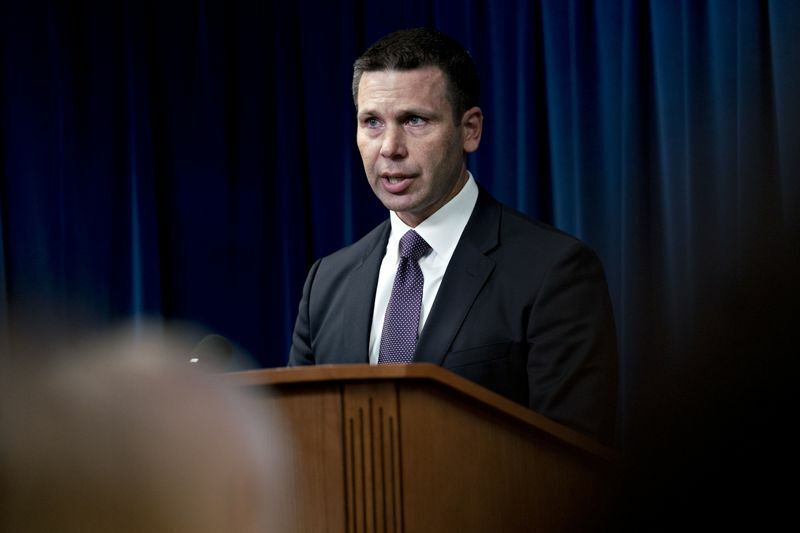 The president named Kevin McAleenan, the commissioner of Customs and Border Protection, a component of DHS, as acting secretary of the department. Trump won election in 2016 in part on promises to build a border wall and crack down on undocumented immigrants, pledges that are unraveling after lawmakers refused to give him all the money he wanted for a wall and a spike in border crossings. The U.S. apprehended more than 66,000 people in February after crossing illegally -- an increase of more than 18,000 from a month earlier --and Nielsen has said that apprehensions would approach 100,000 in March. Nielsen was a lightning rod for criticism within and outside the Trump administration over U.S. policies on the southern border. She came under heavy attack from lawmakers last year over administration policies that resulted in undocumented children being separated from their families and held in detention facilities after they crossed the border. She was a protégé of former White House chief of staff John Kelly, who preceded her as Homeland Security secretary. He left the White House late last year after repeated clashes with Trump. One person familiar with the matter said she met with Trump on Sunday hoping to persuade him to follow a plan to legally combat undocumented immigration. Miller, one of Trump’s longest serving and most trusted aides, is considered anti-immigrant by some Democrats and has been blamed by some Republicans for the demise of bipartisan legislation to overhaul the immigration system. He regards many such proposals as “amnesty” for people in the country illegally. Miller didn’t respond to questions about Nielsen or his own elevation on immigration policy. White House Press Secretary Sarah Huckabee Sanders declined to comment on Nielsen’s resignation beyond Trump’s tweets announcing her departure. The president and other White House officials have been frustrated by the slow, tangled process to move new immigration proposals through the government, which often involves as many as four different Cabinet agencies. Some administration officials lament that no single adviser has full authority over immigration policy or the clout to resolve internal disputes, the people said. Officials with no direct role in immigration such as National Security Adviser John Bolton, White House Deputy Chief of Staff Chris Liddell and the president’s son-in-law, Jared Kushner, have occasionally tried to adjudicate, the people said. Trump blamed Nielsen for delays in enacting some of his policies -- even those over which she had little control, including building more border wall and re-assigning immigration judges at the Department of Justice, people familiar with the matter said. “I hope that the next secretary will have the support of Congress and the courts in fixing the laws which have impeded our ability to fully secure America’s borders and which have contributed to discord in our nation’s discourse,” Nielsen said in a resignation letter on Sunday. Some of Trump’s immigration policies have met with internal resistance because officials believed they were legally dubious, the people said. But Miller and Trump sometimes regard such concerns as nothing more than ideological opposition. Other officials, though, consider Miller too ideological himself to be an effective leader on the issue, according to two people familiar with the matter. Nielsen repeatedly drew Trump’s ire over the last year but had avoided being fired. But Trump has recently shown increased frustration with the situation at the U.S. southern border. During a visit to the California border on Friday, Trump declared the U.S. “full” and said no more migrants from Central American could be accommodated. Late last month, Trump threatened to close the U.S. border with Mexico to stop the spike in migration. He backed off after complaints by U.S. business groups and Republican lawmakers, but has not foreclosed the possibility. Trump, Nielsen, and McAleenan jointly participated in a roundtable discussion on border security at a border patrol station in Calexico during the president’s trip. In their remarks, Trump and Nielsen thanked each other for making the visit. They traveled to the state separately. Nielsen, 46, had faced criticism from Trump over things she couldn’t control, such as court rulings against his plan to end the Deferred Action for Childhood Arrivals immigration program, his ban on refugees from predominantly Muslim nations, and a perceived inability to effectively stem or choke off border crossings. Harshly criticized by the president during a cabinet meeting in May, Nielsen considered submitting her resignation at that time, according to the New York Times. Her office called the reports false. McAleenan, 47, was sworn in March 2018 as commissioner of Customs and Border Protection after serving as acting commissioner at the start of the Trump administration and previously was deputy commissioner.